SSR LLC – GE – Follow the (New) Words – Buy! 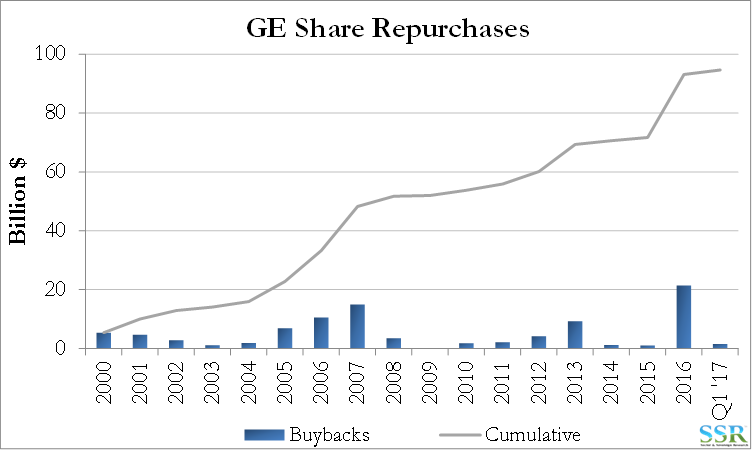 It has been established that there is a problem at GE – manifested in financial and stock underperformance – things are bad! 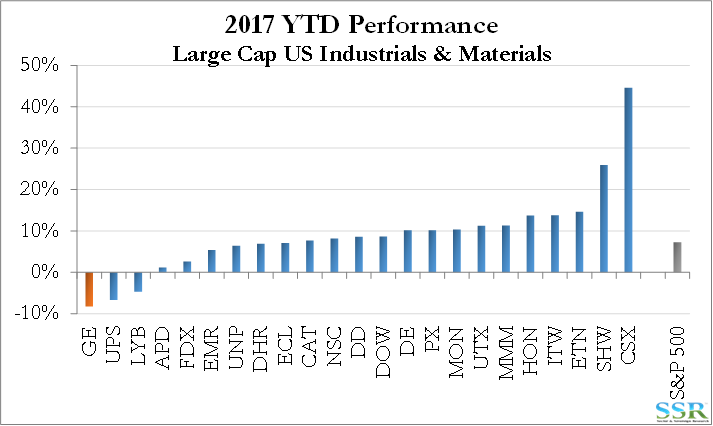 GE has been the laggard year-to-date – Exhibit 2 – despite positive surprises in earnings and revenue in Q1 2017 – Exhibit 3 – and despite a more active Trian, in terms of discussions and agreements with the company on growth goals and compensation. 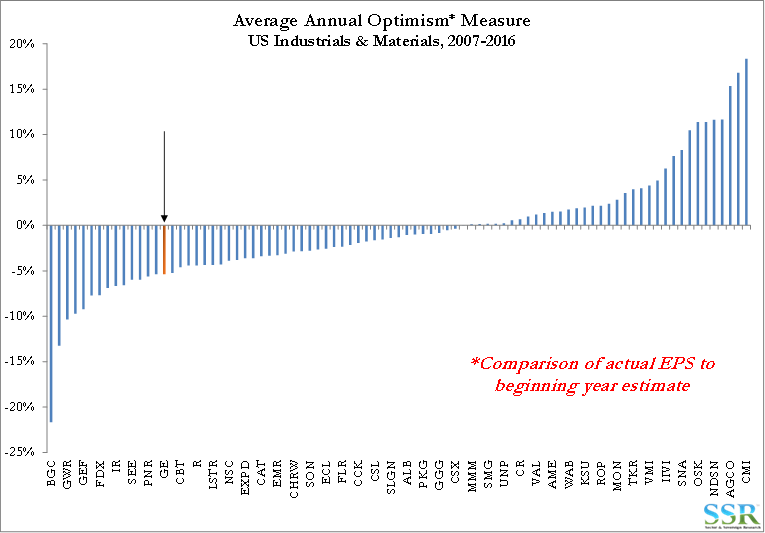 Activists generally have a good track record of fixing optimists and GE has been one of the most optimistic companies in the Industrials space – Exhibit 4. Whether they are successful because they cause management to become more self-aware and tone down ambition to more appropriately fit the core company strengths, or whether they help management realize what is needed to meet ambitious targets and execute better depends on the circumstance, but it does not matter. The key is to get capital allocated appropriately and then drive the business to maximize the return on the capital that has been deployed. 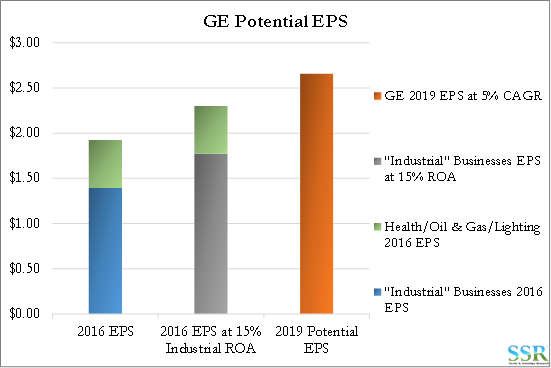 A greater focus on execution at GE will likely drive one of a couple of outcomes: it will either produce the better earnings growth that we identified in our earlier piece on GE, with the analysis summarized in Exhibit 5, or it will provide a compelling case for a change in direction – break-up, new management etc. Either way, change is likely coming! 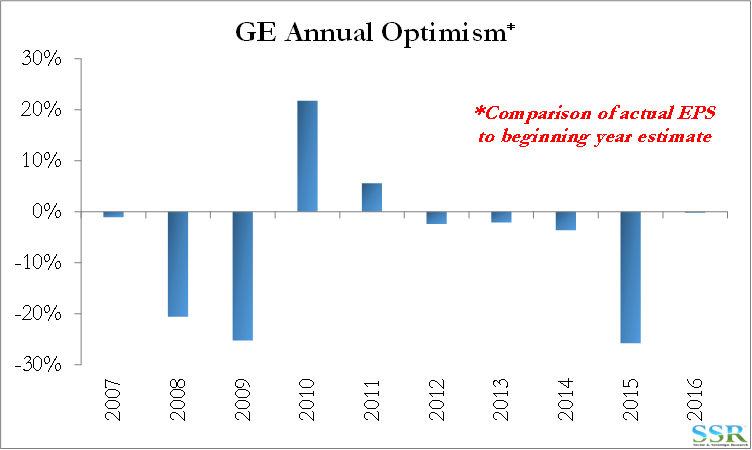 GE is a very poor predictor of its own potential – and as shown in Exhibit 4, one of the worst in the group. In Exhibit 6 we show the annual data for the last 10 years. Activists tend to help companies focus on strategy and what are and are not reasonable goals – whether that is a focus on cost structure or understanding the real potential returns of the business. 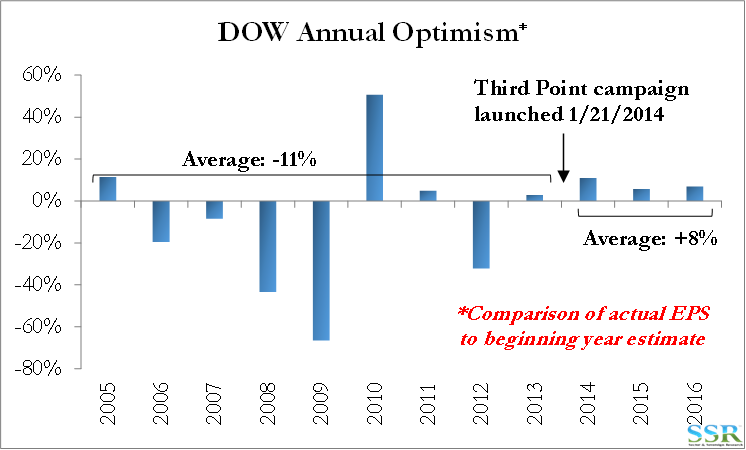 Dow Chemical is probably the best example with the arrival of Third Point coinciding with a much more focused and predictable company – Exhibit 7. Dow has been one of the better performers in the sector since that point. Dow will argue that they were on the right path before Third Point arrived, and there is some validity to that argument, but having a strong investor looking over your shoulder does tend to keep consistency. The stories are the same for both Air Products and DuPont, although the charts are not as supportive as they are for DOW – Exhibits 8 and 9. 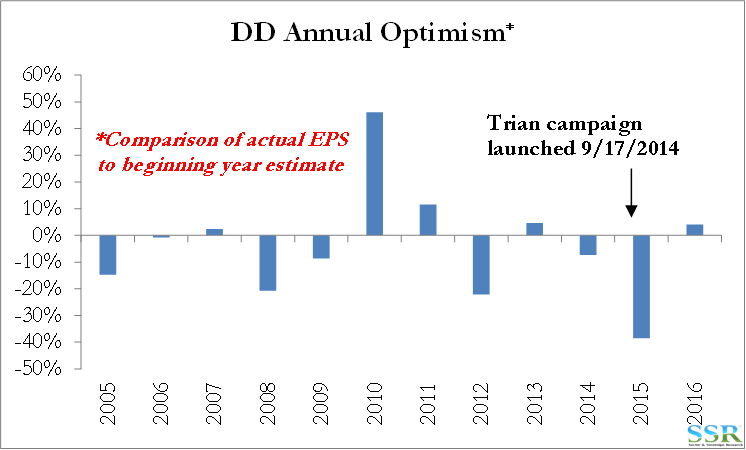 In both cases the activists took time to make change and the initial results were not as clear as they were for DOW – for example the significant DD miss in 2015 was an overestimation of the fortunes of the Ag business made by prior management and before Mr. Breen showed up – since then there have been marked improvements. 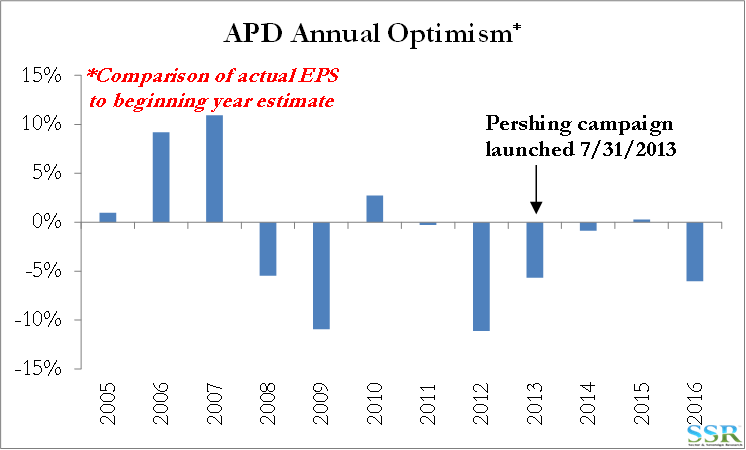 Air Products set some very lofty goals and met them for the first couple of years, falling short in 2016. The most important point here is that all were points of infection for the stock and for shareholder returns. 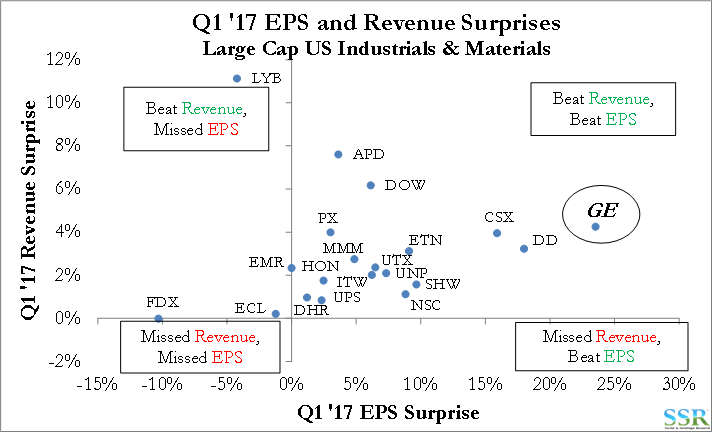 In Exhibit 1 we show the change in sentiment in Q1 2017 by picking key words from the earnings transcript and looking for repetitions – in Exhibit 10 we show the same charts but directly below we show the aggregate for GE, HON, UTX and MMM. Historically, based on the imbedded optimism within GE we would not pay much attention to the tone of an earnings call, but GE appears more bullish than the pack on a qualitative basis and it is possible that this sentiment should be taken more seriously given the new focus. 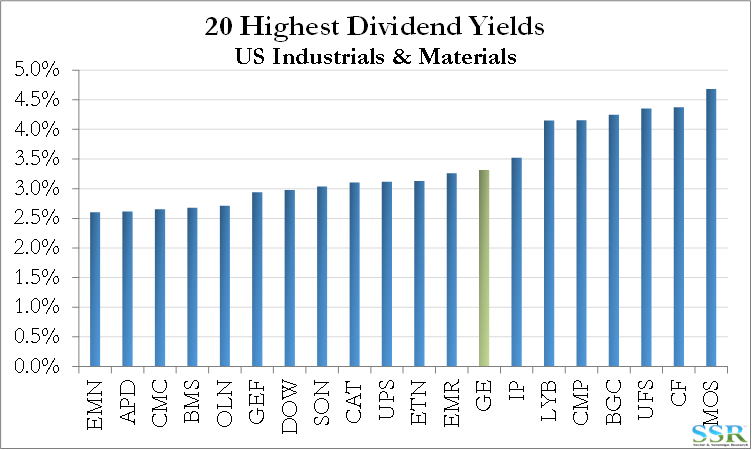 In the meantime, you are paid to wait, with a reasonable dividend yield and a meaningful share buyback – Exhibits 11 and 12.